Use this function to export wireframe geometry to a CADL 19 file format. The file can then be imported (read) to older version of CADKEY (R19 and previous) as well as other programs that support this file format. The following dialog appears when CADL is selected from the File>Export submenu. When you have finished configuring the available dialog options, click OK/RUN to proceed. Export Group Table – When selected, the group table is written in the CADL file. 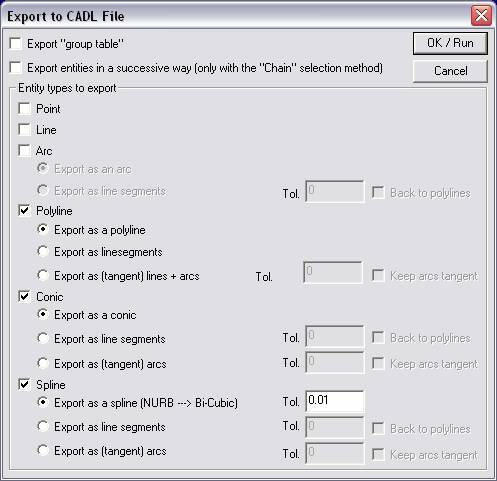 Export Entities in a Successive Way (only with Chain Select) – When selected, and when Chain is the active selection method, the selected entities will be written in the CADL file in the chain order. Entity Types to Export – Specify the entity type(s) you wish to export by checking the appropriate boxes. When Arc, Polyline, Conic and Spline is selected, you can specify whether to export the entity type as that type, or as a series of line segments. When Back to Polylines is selected, the selected entity type will be written to the CADL file as polylines.